Celebrated in Mexico and select locations in the United States, Día de los Muertos (Day of the Dead) is a holiday that takes place October 31st through November 2nd. Día de los Muertos is used to honor the dead, whose spirits visit every year, once a year, in a traditional and festive way. On the outskirts of Mexico, relatives of the dead travel to the cemeteries in which their lost loved ones are buried, and they have a picnic consisting of their loved one’s favorite foods. Grave sites are often decorated with toys for the children who have passed away, and bottles of tequila for the adults. If you are familiar with any Día de los Muertos celebration, you’ll probably find yourself most familiar with the tradition of transforming a room into an altar for the deceased relative. This is a tradition that is practiced in larger cities in Mexico and in the United States. Having taken Spanish classes since my freshman year in high school, I’ve had many opportunities to learn the history and origins of Día de los Muertos. As you may or may not have guessed, I find the most fascinating part of the tradition to be the food. Just as families provide for lost loved ones at their grave sites, they provide favorite foods for their loved ones at the altars as well. So when the spirits make their yearly visit, they will be pleased by the food and drink you have left for them to enjoy. You may see different foods finding their place among different altars, but one food I guarantee you’ll see every time is “pan de muerto”, or “bread of the dead”. Pan de muerto is a sweet bread that comes in many varieties. Mexican sweet bread is a blessing from the baking gods, and is a food that is certainly worth trying. 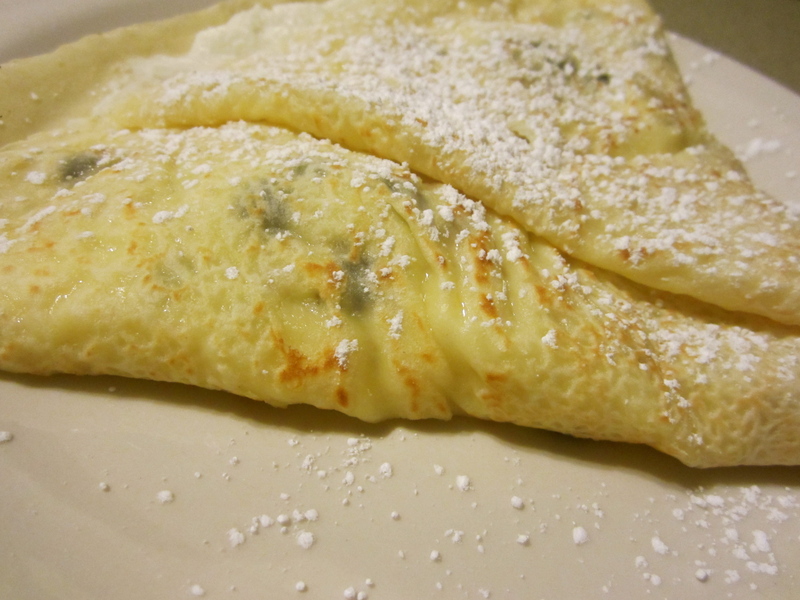 This simple egg-bread topped with sugar, is the staple of a rich, cultural tradition. I suggest making pan de muerto a to-do on your list of things to bake this fall. In addition to the different foods you will find associated with Día de los Muertos, there are ceremonies and events that take place to celebrate the lives of those who have passed away. You’re a Jerk. Chicken, That Is. Outside of the culinary world, “jerk” is a term that is often used in a derogatory context. “Jerking”, on the other hand, became a dance fad for a solid year. However, on the island of Jamaica, “jerking” is a unique method of wood-fire barbecue. This cooking technique has transformed throughout the years, beginning with cooking meat (traditionally pork or chicken) over a simple, slow flame in a pit, to cooking over fire inside the half of a steel drum. Jerk-style cooking is not only unique in method, but unique in flavor as well. The preferred meat uses a dry-rub containing the two most vital ingredients for a Jamaican jerk spice: allspice (pimento) and Scotch Bonnet peppers. Scotch Bonnet peppers are among some of the hottest peppers in the world, with a heat rating of 100,000 – 350,000 Scoville units. To put that in perspective, Tabasco sauce has a rating of 3,500 – 8,000 Scoville units. This pepper means business. At The Breadfruit in downtown Phoenix, Arizona, I was able to try this intimidating (but delicious) jerk chicken dish for myself. 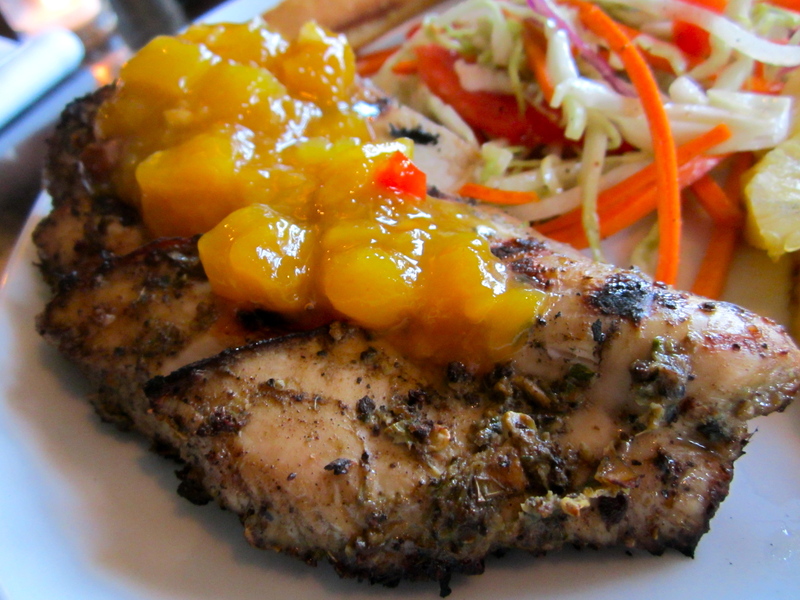 Their “Jerk Chicken off the Grill” is a chicken breast marinated in their very own house spicy jerk rub, grilled over pimento wood, and topped with a mango chutney. I’m not particularly adventurous when it comes to spicy food of any sort, but this was well worth it. The flavors I experienced in this dish weren’t typical of a spicy Asian or Mexican style food. The jerk chicken had a tropical, spicy flavor about it (enhanced by the mango chutney) and was a flavor I hadn’t been introduced to, but was happy to have met. Seek out your warm beach, grab a towel, your Jamaican accent, a favorite steel drum band (I have one, don’t you? 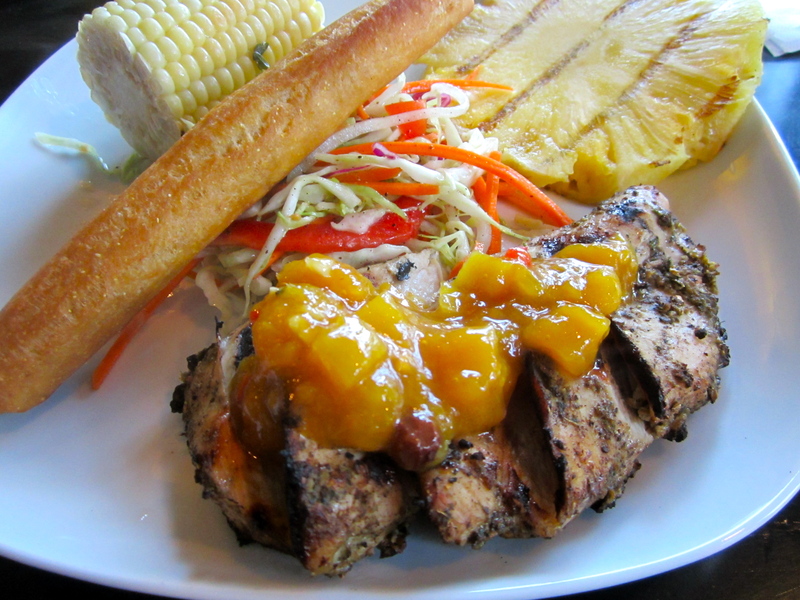 ), and enjoy the tropical flavors a dish like jerk chicken has to offer. Ya mon, check it deep. Forgive the cliché pop-culture reference of a title I have chosen. Thank you, New Boyz. Coffee is oftentimes considered a college student’s best friend, and I can attest to that. Coffee is what I rely on to be my morning pick-me-up or my midday energy boost. But I must give credit where credit is due, and I’d like to thank Ethiopia for this wonderful cup of bliss I am holding. Ethiopia is believed to be the birthplace of coffee, and wasn’t consumed until the Arab world caught wind of its mesmerizing aroma. It eventually spread to India, and soon enough took over all of Europe. Today, the top coffee producing countries aren’t in Europe, but in Central and South America and Asia. Brazil is responsible for producing the majority of the world’s coffee to date. 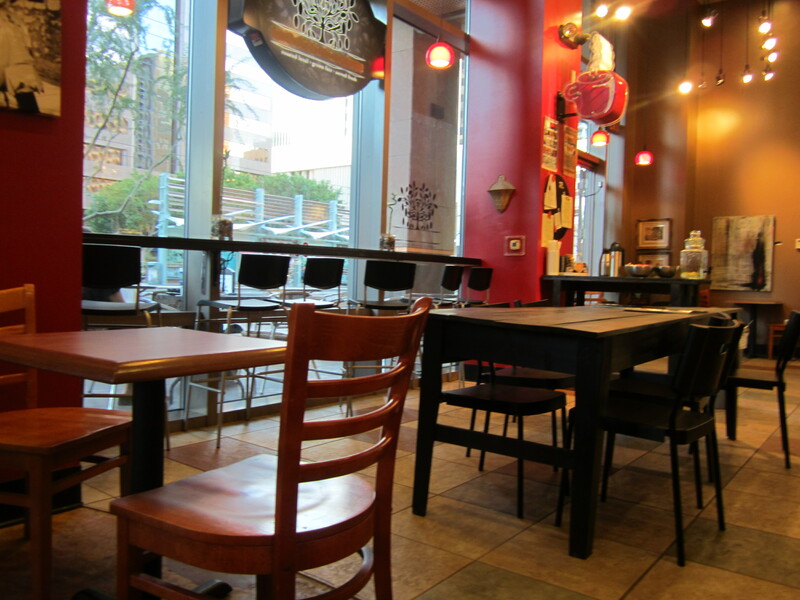 Living in the urban environment that is downtown Phoenix, I’ve stumbled upon various coffee shops in the area. Late this afternoon, I ventured down Central Ave. to One Coffee Co. to enjoy whichever coffee on the menu caught my eye. In a month like October, I’m immediately drawn to anything and everything with the word “fall” in front of it, and this afternoon, the “Fall Specials” menu had me at hello. A café mocha is a classic coffeehouse beverage that is an adaptation of the café latte. 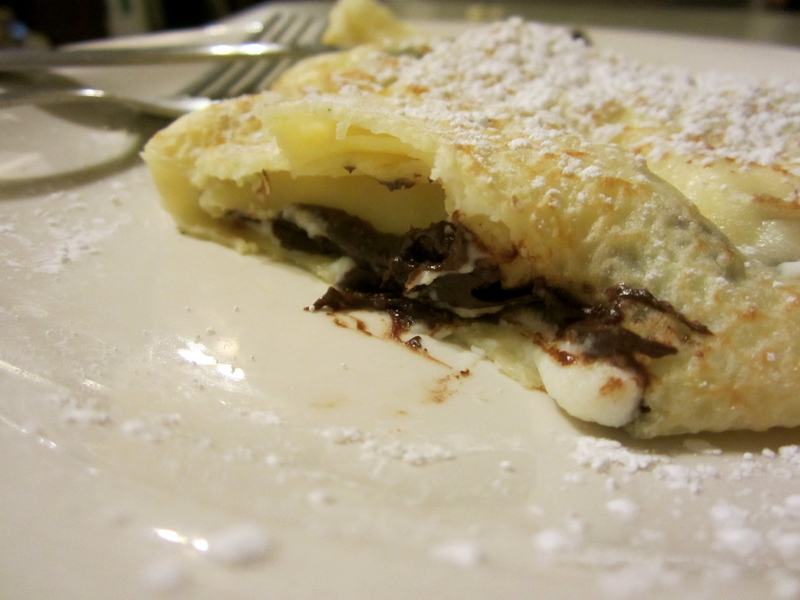 The café mocha is known for its subtle chocolate flavor. 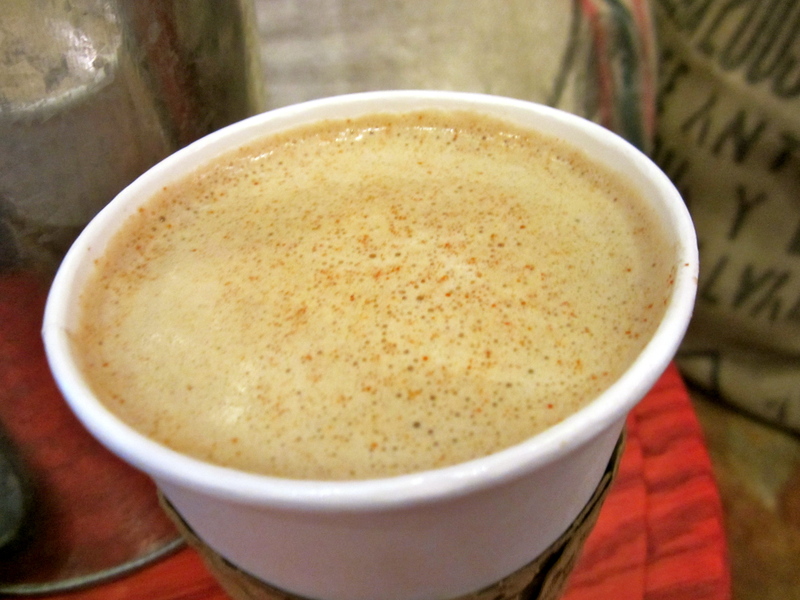 The Spanish Mocha, however, is made like a normal café mocha with the addition of cayenne pepper. This combination of sweet, bitter, and spicy can be found in coffee throughout the Americas (a favorite of the Mayans). Adding the cayenne pepper to the coffee did not create a spiciness similar to that found in a typical spicy dish. This is an evident spicy that is felt in the throat rather than on the taste buds, adding to the warmth of the coffee itself. I’ve come across a unique coffee blend or two, but this was the most interesting (and delicious) blend I’ve experienced. The next time you go on a coffee run, don’t be afraid to wake up with a little flair and try those uncommon blends of coffee. You never know when you might stumble upon your next preferred coffee beverage. Cajun cuisine is one of the most diverse types of cuisine in the world of food today. Several of its dishes are arranged like a symphony of world influence, compiled of flavors found in African, Caribbean, French and Spanish dishes. There is no better way to introduce this medley of flavors than throwing them all into one Cajun dish, and that dish, would be gumbo. Originally from Louisiana, gumbo is a thick stew or soup, that emerged in the 1700s. Gumbo was a cheap way to make a large quantity of food at one time, using minimal amounts of meat. Since a multitude of nationalities lived together in the south, gumbo was a proactive way to share cultural differences through the food they created. Cajun gumbo (as opposed to Creole gumbo) is heavier with French influence and is often darker and spicier. A typical Cajun gumbo is made with roux, which is a cooked wheat and flour mixture. Roux is what gives gumbo its stew-like consistency. Upon adding any type of shellfish or meat (andouille sausage, catfish, shrimp) and vegetables (bell peppers, celery, onions) the heat factor is a necessity, and Cajun gumbo is widely known for its spicy quality. What gives this dish its heat is the liberal amounts of cayenne pepper used in each batch. A nice way to balance out the assortment of flavors and spices, is pouring the gumbo over rice. As you may have already inferred, gumbo is a perfectly hearty meal made to serve many. So, at your next gathering, why not break out the trumpet that’s been hiding in the attic? Turn your home into its very own French Quarter and share a gumbo recipe or two with friends and family.